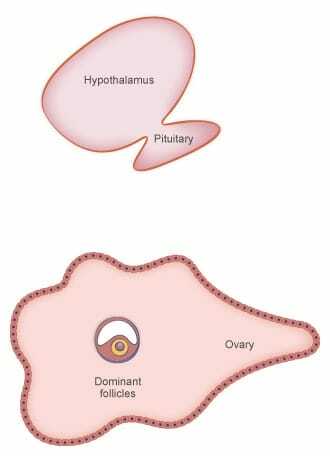 Once the tertiary follicles are formed in the ovaryFemale reproductive glands, located symmetrically on either side of the uterus, which produce the female gametes., a hormone-dependent wave of follicles emerge. Several waves of follicles may occur until finally the ovulationExpulsion of an ovum from the ovary in female animals. takes place. How do recruitmentPhase of follicular wave during which a cohort of twenty follicles resumes its growth under the influence of FSH. and beginning of follicular growth take place? Causes the recruitmentPhase of follicular wave during which a cohort of twenty follicles resumes its growth under the influence of FSH. of follicles and ensures their growth. Stimulates the conversion of androgens into oestrogens and leads to the appearance of LHLuteinising hormone: responsible for the final maturation of the follicle and ovulation. receptors on the cells of the granular layer of the ovaryFemale reproductive glands, located symmetrically on either side of the uterus, which produce the female gametes..
Oestrogens secreted by the follicles work together with the FSHFollicle Stimulating Hormone: responsible for the growth of ovarian follicles. to stimulate the growth and development of the antrum of these follicles. The increase in the level of oestradiolSteroid hormone (derived from sterols, polycyclic alcohols complex) mainly secreted by the female ovary. 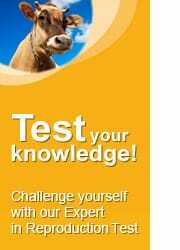 Its increase is involved with ovulation. has a positive feedback effect on GnRHGonadotropin Releasing Hormone is secreted by the hypothalamus causing the release of FSH and LH. production. How do selectionStage of the Follicular wave in which 3 or 4 previously recruited follicles move from an FSH-dependent phase to an LH-dependent phase. and dominancePhase of the follicular wave in which the largest follicle takes over the rest and becomes the dominant follicle maturing completely. of follicles take place? 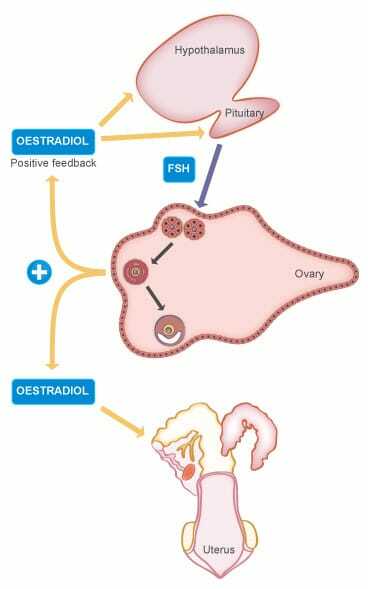 First: High levels of FSHFollicle Stimulating Hormone: responsible for the growth of ovarian follicles. Associated with FSHFollicle Stimulating Hormone: responsible for the growth of ovarian follicles., LHLuteinising hormone: responsible for the final maturation of the follicle and ovulation. stimulates oestradiolSteroid hormone (derived from sterols, polycyclic alcohols complex) mainly secreted by the female ovary. 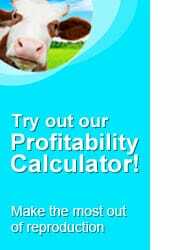 Its increase is involved with ovulation. and inhibinHormone secreted by the follicles (or Sertoli cells in the male) that selectively inhibits FSH secretion. production by the large follicles. 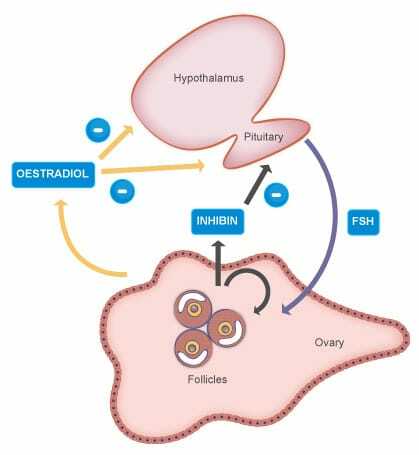 The constantly high levels of synthesised oestrogens and inhibinHormone secreted by the follicles (or Sertoli cells in the male) that selectively inhibits FSH secretion. 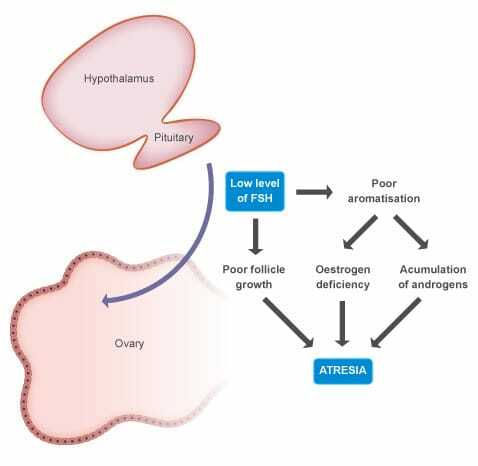 lead to a decline in the release of FSHFollicle Stimulating Hormone: responsible for the growth of ovarian follicles.. This decrease results in selectionStage of the Follicular wave in which 3 or 4 previously recruited follicles move from an FSH-dependent phase to an LH-dependent phase. of the dominant follicleSmall secretory or excretory cavity. 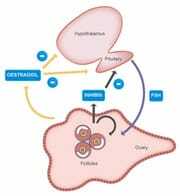 Ovarian follicles grow until ovulation or female gamete emission.. In fact, before selectionStage of the Follicular wave in which 3 or 4 previously recruited follicles move from an FSH-dependent phase to an LH-dependent phase., the follicles are FSHFollicle Stimulating Hormone: responsible for the growth of ovarian follicles.-dependent, whilst the dominant follicleSmall secretory or excretory cavity. Ovarian follicles grow until ovulation or female gamete emission. acquires LHLuteinising hormone: responsible for the final maturation of the follicle and ovulation. receptors, thus allowing it to survive when FSHFollicle Stimulating Hormone: responsible for the growth of ovarian follicles. levels decrease. It has become LHLuteinising hormone: responsible for the final maturation of the follicle and ovulation.-dependent. The dominant follicleSmall secretory or excretory cavity. Ovarian follicles grow until ovulation or female gamete emission. continues to grow due to its increase in sensitivity to FSHFollicle Stimulating Hormone: responsible for the growth of ovarian follicles. and LHLuteinising hormone: responsible for the final maturation of the follicle and ovulation. and by the production of local growth factors, particularly insulin-like growth factor. Why does follicular atresiaParticular form of aplasia: refers to an ovarian follicle that has not completed its final phase of growth and maturation, thus evolving to regression. take place? Reduced FSHFollicle Stimulating Hormone: responsible for the growth of ovarian follicles. secretion causes a growth deficit in the unselected follicles, poor aromatisation, which in itself provokes a lack of oestrogen, and an accumulation of androgens, leading to atresiaParticular form of aplasia: refers to an ovarian follicle that has not completed its final phase of growth and maturation, thus evolving to regression..